December 15, 2016 Albuquerque, New Mexico - On the night of December 13 to 14, 2016, thousands of people in the Spokane Valley region of Washington state reported on Facebook and Twitter about strange, eerie sounds coming from the sky all night long. Linda, below is a link and photograph of two beams at same time of noises from our local KHQ station in Spokane, Washington, posted by a resident in comments for KHQ Facebook about strange noises all night in Spokane Valley, WA. I live on South hill of Spokane, so did not hear this. Also windows were closed because it is frigidly cold. These noises sound very much like posts you have made to Earthfiles. 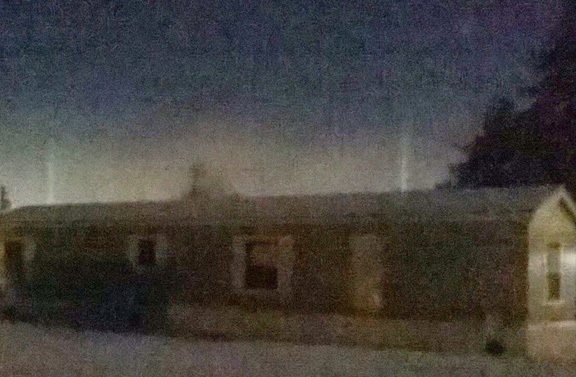 Photo on KHQ Facebook page December 14, 2016, of two vertical whitish beams that appeared above the foreground house at the same time that eerie, metallic sounds were being recorded on an iPhone by a Spokane Valley, Washington, resident on the night of Dec. 13-14, 2016, and posted at the KHQ Facebook.